Caswell's Sapphire metal polish will quickly and easily bring a shine to all metals. Apply with soft flannel cloth, rubbing polish generously over item to be polished. Can be polished off with a soft cloth by hand or using a flannel buffing wheel. Can be polished off when wet or it’s better to leave it until the polish is dry and then buff it off. Suitable for all metals, use carefully on any plated material. 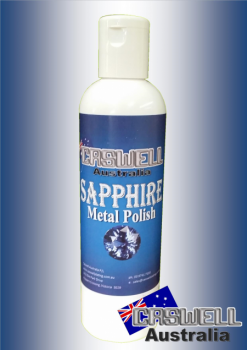 Will remove tarnish and stains from metal and can be polished to a high lustre.